The rediscovered Heredia Robber Frog (Craugastor escoces). Courtesy by Gilbert Alvarado (Universidad de Costa Rica) and the University of Ulm. All rights reserved. 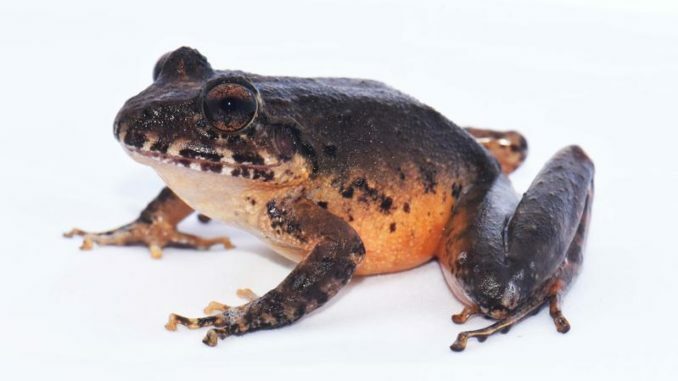 The Heredia Robber Frog (Craugastor escoces), which had not been observed since 1986 and was declared extinct in 2004 by the IUCN (Bolaños & Chaves 2004), has been rediscovered. Gilbert Alvarado Barboza, a researcher with the University of Costa Rica’s (UCR) School of Biology, and Randall Jiménez Quirós, a student at the University of Ulm, Germany, found the frog on 19 September 2016 at the edge of a protected forest in the Juan Castro Blanco National Park, in the province of Alajuela, Costa Rica. They were conducting a routine amphibian count as part of a research project at the Juan Castro Blanco National Park when they made their discovery. The specimen is an adult female and measures just over 6 centimeters (2.3 inches) long, researchers confirmed Tuesday 6 June 2017 at a press conference as part of the UCR’s Environmental Week. It could easily been identified by its brown colour with a characteristic red coloured belly. This species had been described in the east and central part of the Central Volcanic Range, but not in the west, where the Juan Castro Blanco National Park is located. According to Alvarado, this is of great importance because its appearance at this site extends its distribution range. The discovery occurred in a ravine at an altitude of 1,820 meters (5,971 ft), which makes researchers think there must be a population surviving in the park. Little is known about the species, as it has hardly been studied. “It was a completely clear night, without rain, starry, with full moon; That is, with all the conditions to not see frogs,” said Alvarado, who explained that the first thing they observed was the frog’s eyes, which glow in the light from their spotlight. “These frogs like to live in the caves around the ravines,” added the biologist. Precisely, this group was the one that was most affected during the decline of the amphibians. According to the researchers, there is a combination of factors that affected the reduction of amphibian populations and their disappearance. In Costa Rica, the first is the destruction of habitat, in addition to climate change and the spread of the fungus Chytridiomycosis. Chytridiomycosis is an infectious funcal disease of amphibians, caused by the chytrid Batrachochytrium dendrobatidis. 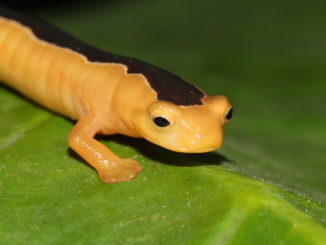 The researchers decided to keep the specimen alive and to start an amphibian conservation program at the UCR. The female is currently living at a UCR terrarium under permanent monitoring and aseptic conditions that are controlled for temperature and humidity. The conservation program will be based at the UCR’s Alfredo Volio Mata Experimental Station in Ochomogo, Cartago. Additionally, there is a need to take undertake conservation actions that help the surviving population of this frog species in the wild. “Each animal is a product of evolution and is a design that has taken millions of years to acquire the genetic material that forms that species. When you lose a species, not only does that leave an empty niche, but also the function that it fulfills as well as its biological design disappears,” explained Alvarado.